NetworkNewsWire Editorial Coverage: Changes in the way people make payments and receive goods have created a new vision for the future of shopping. Increasingly efficient delivery systems bring goods to shoppers’ doorsteps. Electronic payment is making payment processing faster for consumers and businesses. Blockchain offers a potential route to further speed up payment systems. All of this will have consequences for the companies providing processing power. SinglePoint, Inc. (OTCQB: SING) (SING Profile) is involved in two of the biggest shopping technology trends, having developed both a delivery system and an electronic payment wallet. Those payments are made using cryptocurrency, produced through the mining operations of companies such as the Marathon Patent Group, Inc. (NASDAQ: MARA). PayPal Holdings, Inc. (NASDAQ: PYPL) remains a leader in electronic payment and has made acquisitions to ensure its position. The need for more memory and processing power increases demand for secure data storage, which is provided by companies such as Seagate Technology PLC (NASDAQ: STX). Even the eminent legacy brand International Business Machines Corporation (NYSE: IBM) is involved in these changes with its own blockchain payment system creation. In the 20th century, shopping underwent a transformation. For most people, shopping had simply been a practical activity, a way of getting what they needed. But as consumer culture took hold, it became a thing of pleasure as well. Shopping developed into browsing the aisles of specialty shops for a wide range of enjoyable luxuries, from fine foods to console games. Now, shopping has been transformed again. Technology is removing many of the inefficiencies from supply chains and allowing customers to get what they want faster and cheaper. They still browse for pleasure, but now that’s as likely to take place online as in a city center or a mall. Even for those venturing out to a local shop, the experience is changing. Checkouts are being replaced by self-service stands; cash by electronic payment. 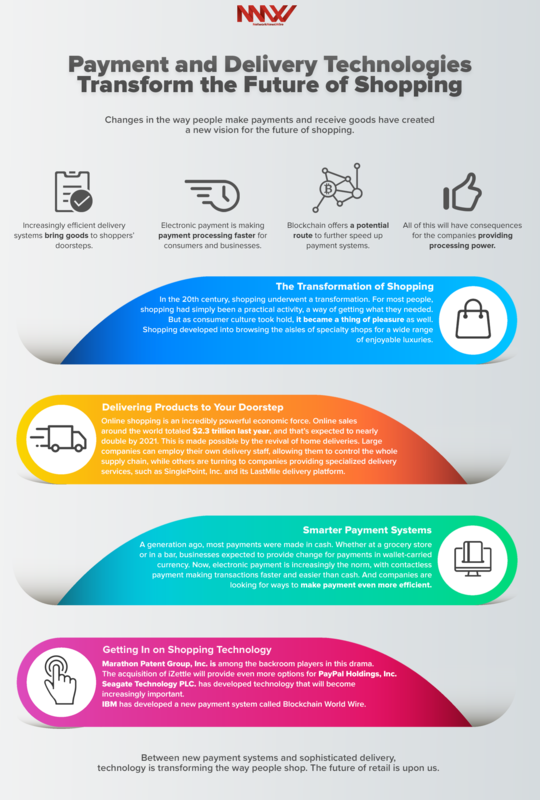 Two of the most important developments in the latest transformation of shopping are home delivery and payment systems. Online shopping is an incredibly powerful economic force. Online sales around the world totaled $2.3 trillion last year, and that’s expected to nearly double by 2021. This is made possible by the revival of home deliveries. Large companies such as Amazon can employ their own delivery staff, allowing them to control the whole supply chain, while others are turning to companies providing specialized delivery services, such as SinglePoint, Inc. (OTCQB: SING) and its LastMile delivery platform. LastMile is a prime example of the ways that these services can benefit both businesses and customers. By making the most of superior technology and systems design, LastMile can make delivery systems more efficient while providing more information, cutting costs and removing the frustrations of uncertainties and delays. Designed to tackle the final few miles from retail outlets to consumers, LastMile has been built to serve small- to medium-sized businesses, those who can’t afford to build their own delivery systems. It provides a way to schedule deliveries, track the location of products and estimate the time of arrival. For businesses, it means more control, while for customers it means more precise delivery times — removing the need for them to wait at home for hours because of a vague delivery window. E-commerce represents 23 percent of retail sales in China and 19 percent in the United Kingdom, but only 9 percent in the United States. There’s clearly huge potential for growth in North America. Customers are becoming increasingly demanding about deliveries. According to a report by member-based business intelligence firm L2, 25 percent of e-shoppers would abandon orders that can’t be completed in a single day. To meet those expectations, faster, more efficient delivery is clearly needed. The ways that customers can order home-delivered goods are increasingly sophisticated. Retailers are anticipating a future where self-stocking store cupboards and virtual fitting rooms will make it even easier for consumers to order exactly what they want, when they want, with products such as LastMile ensuring that it gets to them. When looked at as a way of obtaining products, cutting out trips to the shops has removed an inefficiency from shopping. The resulting decline of physical stores is seen as a downside by detractors. But with coffee shops, bars and other social spaces rising in their place, it’s clear that this isn’t the urban armageddon doomsayers predict. In fact, the services springing up in place of shops should be able to benefit from another of the major developments in how people shop — new payment systems. A generation ago, most payments were made in cash. Whether at a grocery store or in a bar, businesses expected to provide change for payments in wallet-carried currency. Now, electronic payment is increasingly the norm, with contactless payment making transactions faster and easier than cash. And companies are looking for ways to make payment even more efficient. SingleCoin stores cryptocurrencies such as Bitcoin. Accepted by a growing number of retailers, these international currencies only exist in digital form. They allow users to make payments directly to each other, cutting out banks and payment-processing businesses from the equation. This increases the speed with which payments can be received and improves the efficiency of transactions, as well as giving a greater degree of control to currency holders. Public awareness and use of cryptocurrencies has increased significantly in the past two years, but SinglePoint has provided a further boost. As part of the launch of SingleCoin, it was one of the first companies to run a national television advertisement for a cryptocurrency wallet. Featuring Shark Tank’s Kevin Harrington, the promotion was a success for the company, helping to attract 12,000 users in the first few weeks. Cryptocurrency has the potential to further transform the way people shop thanks to its basis in blockchain technology. Some forms of blockchain can be used to create smart contracts, in which actions are automatically carried out when conditions are met. By plugging payment into smart contracts, blockchain could trigger automatic delivery as soon as a product is paid for. Your payment from a SingleCoin wallet could one day activate the order that will send your shopping home. With both the way we pay for goods and the way we receive them changing, plenty of companies are now involved in technology that could transform shopping. Among the backroom players in this drama are cryptocurrency mining companies such as Marathon Patent Group, Inc. (NASDAQ: MARA). Cryptocurrency mining involves processing large amounts of electronic data to find the mathematical solutions on which these virtual coins are validated. This requires large amounts of computer processing power, often provided by specialist data centers. Marathon launched a new one of these centers in Quebec earlier this year, allowing it to provide a flow of cash to the digital economy. PayPal Holdings, Inc. (NASDAQ: PYPL) offers a range of digital options to make electronic payment smooth and easy. By connecting payment accounts to email addresses, it has simplified online payment while providing customers with a secure payment gateway. The recent acquisition of iZettle, a Stockholm-based financial technology company, will provide even more options for PayPal’s payment technology to support small- and medium-sized businesses in accessing modern shopping technology. A global leader in data storage solutions, Seagate Technology PLC (NASDAQ: STX) has developed technology that will become increasingly important as more shopping is done online and through cryptocurrencies. Greater storage capacity will be needed to hold digital currencies and products, as well as to deal with sophisticated shopping software. With consumers using their phones to browse and make payments, Seagate’s mobile data storage products will make the company particularly relevant for the future of retail. Predictions that blockchain and cryptocurrency won’t last look increasingly implausible thanks to the involvement of big players such as International Business Machines Corp. (NYSE: IBM). IBM has developed a new payment system called Blockchain World Wire, designed to remove intermediaries and support direct payments across existing borders. If a global tech giant such as IBM is betting on the success of blockchain, then its future, and customers’ access to this fast payment technology, look secure. Between new payment systems and sophisticated delivery, technology is transforming the way people shop. The future of retail is upon us.